Our Fast Maths puzzles are all geared toward one thing - dusting the cobwebs off the mental arithmetic part of your brain and training it to get it up to speed, fast! We have a large range of over 10 different maths based mental arithmetic puzzles, all of which will help to develop both the speed and the accuracy of your mental arithmetic. 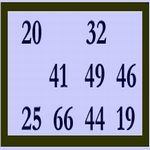 These puzzles are great for adults and for children alike, and are indeed also available in a range of different difficulties so whether you are a maths novice or someone who needs challenging puzzles and stringent time limits to improve your mental abilities even further, we will have the fast maths puzzle that is suitable for you.